Fall Out Boy bassist Pete Wentz has revealed in an interview with Rolling Stone that he is relaunching his record label Decaydance under the name, DCD2 Records. Panic! 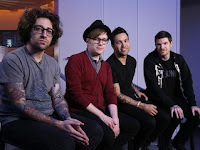 at the Disco, Cobra Starship, Travie McCoy and Fall Out Boy will still be on the label roster. The first DCD2 music will come from Lolo and "a big announcement from Cobra Starship" coming soon after. More information about DCD2 Records can be found here.